Paella might be my favourite dish. For me it’s one of the most delicious things you can eat. It’s made all year round but changes with the seasons. I wonder if it’s one of those dishes like ragù in Italy where there are as many recipes for it as there are cooks. Felicity Cloake quotes Valencian chef (Valencia being where paella originated) Llorenç Millo as saying that there are as many recipes as there are villages. We haven’t had a holiday in Spain for many years but we used to go to Nerja to stay in a friend’s appartment. It was within easy walking distance of the beach along which there were several great restaurants. Our favourite was the one where a man made paella over an open fire in the biggest paella dish you’ve ever seen. The first time I saw this I watched him, enthralled, as he gradually added all the elements. By the time he’d finished quite a crowd had gathered round to watch and then, finally, to eat. He used to make what I consider to be be a traditional paella comprising chicken and seafood, but apparently paella didn’t start out as a fish or seafood dish at all. Over the years I’ve made various permutations, the latest being this haddock one, based on a recipe by Tamasin Day-Lewis. Hers used monkfish but there was none available when I was shopping and the haddock loin was a good alternative, in my view; I’m sure any firm white fish would work. I’ve read that paella always contains some sort of pig meat (bacon, chorizo or pork) but I don’t think it’s essential. My haddock one doesn’t and in fact I don’t remember the beach one containing any either. Perhaps in future posts I’ll give you the recipe for my chicken and chorizo paella or Ottolenghi’s vegetable one, which is quite superb. And I really ought to try Felicity Cloake’s “perfect” paella too. You don’t have to have a paella pan. 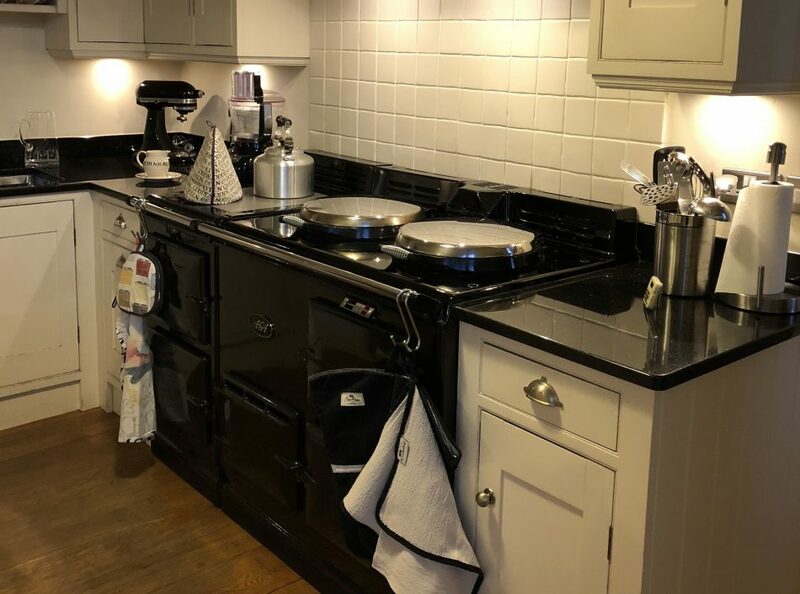 I’m thrilled with the one pictured, a recent purchase, but before I had it, I used either a large, deepish frying pan or a wide but shallow casserole. About 200g mussels, prawns or squid or if you prefer, any combination of these. I used a packet of frozen, cooked mixed seafood, defrosted first. Heat 2 tablespoons of the oil in your pan on the simmering plate. Add the haddock and stir-fry for a couple of minutes until slightly underdone. Tip the fish into a dish with its juices, wipe the pan clean with kitchen paper and return to the simmering plate. Add the remaining oil and then the onion and green pepper. Give them a stir, coating everything in the oil and move to the simmering oven to cook for about 20 minutes until soft, adding the garlic and fennel for the last 5 minutes or so. Meanwhile bring the stock to the boil in a saucepan on the boiling plate and infuse the saffron in it off the heat. Add the rice to the paella pan on the simmering plate and stir to ensure every grain is coated in the oil. Add the wine or sherry, followed by most but not all of the saffron-infused stock, half the parsley and the paprika and season with salt and pepper. Do not stir from this point. Once this is simmering, place it either near the bottom of the baking oven or in the simmering oven, uncovered, until there is very little liquid left. Difficult to give precise timings because I find it varies (and as you know, timings are not usually crucial in an Aga) but maybe 30 minutes in the baking oven and 15 in the simmering oven. If it looks dry and the rice is still not tender, add the rest of the stock. When there’s still a little liquid left above the rice add the fish and seafood, pushing it down into the stock and return to the simmering oven until heated through. It wouldn’t do any harm to leave it for half an hour like this, if you’re not quite ready to eat, but try not to leave it too long if you’ve added prawns, because they go tough and rubbery when overcooked. Place the strips of piquillo peppers on top. Let the rice sit for a few minutes on the warming plate before serving. Finally, decorate with lemon wedges and the remaining chopped parsley.